Today was our second day in the hospital monitoring Cannon for seizure activity. He awoke around 5:30 after a decent night’s sleep. He had woken up a couple of times during the night and tried to bother the leads but not too badly. Nothing I couldn’t handle. Cannon was still incredibly groggy and slurring his words in the morning. So, the nurse called the pharmacy and found out that he was given such a high dose of medication yesterday to get the hook up taken care of that the effects could remain for 24 hours. They weren’t kidding! The effects remained until about the 23 hour mark (around 2 o’clock in the afternoon). These effects did not alter the test, just made him super sleepy. So, he was up for a couple of hours in a fog. I fed him about half of his breakfast before he lost it. Yep. He actually lost it. He threw up. After we got him cleaned up, the resident came in and examined him. She said they believed that the meds from the previous day were probably the culprit. That they had made him nauseous. To have him sip on juice and water for a while before trying more food. By 8 a.m., Cannon was asleep again. His ABA therapist arrived around 8:30 and he was out cold. Snoring, mouth open, the whole nine yards. So, we waited. At about 10:30, he finally woke up and he and his therapist did some light work. They worked with some apps on the ipad, did some simple imitation activities, and a puzzle. I had hoped for more but Cannon was in no shape for more. During this time, a baby in the next room had a massive seizure that sent everyone flying in and out of that room for some time. You want to talk about perspective! I got some fast! I always say it, but some days I get clear examples of this fact. Today was one of them. It could always be worse! 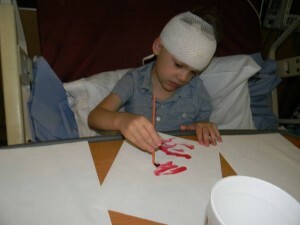 I couldn’t help but tear up and begin praying for this sweet, little child. I did later hear that he is stable, for now. THANK YOU LORD! After his therapist left, I gave Cannon a rice cake with peanut butter to try. It went down fine so he had more juice and the rest of his lunch. Afterwards, I attempted to engage him in any activity I could come up with……books, songs, puzzles, toys, cars, etc. He wasn’t interested in doing much except play with the ipad or watch a video. I want the data taken to be reflective of him doing many different activities. So, I didn’t allow him to fixate. I did use my special button to mark an “event” around 3:30. A staring spell. Around 4:30. 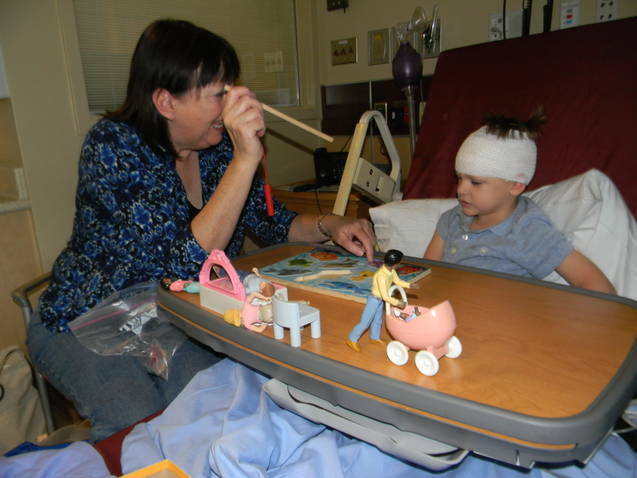 Cannon’s speech therapist paid him a visit and they had a marvelous session. Cannon did protest to it often but, as is typical with most of his therapy sessions, he pushed through and did well. She did all kinds of things with him. They played with an interactive book, acted out actions with dolls, played a turn taking game, did a puzzle, drew on a dry erase board…..all while working on verb tenses, personal pronouns, and asking questions. We were thrilled with how well he did under the circumstances. I will say that I noticed he was beginning to look tired or like he was going to stare off during this hour. I plan to try and push him this hard tomorrow. We actually want to see what his body‘s reaction will be to this. Anyways, after this we painted a couple of pictures, read a couple books, and played a couple of letter games. By dinner time, I could tell he was himself again. He was agitated by the wrap on his head and voicing it. But, overall, it wasn’t too difficult to handle. The neurologist came in tonight and we discussed the day. He said that there was an event in the first 24 hours that was recorded by the machine. He said it was located in the Parietal Lobe which is where “events” on his past EEG’s have also occured. I think he was saying that that fact would already label the EEG “abnormal.” He also went and looked at the episode I marked today and said it showed there was a change at that time but he wanted to see the video before he came to any conclusions. And he can’t watch the video until the test is complete. So, we will wait and see. We also discussed and decided that he will remain in the hospital an extra day. They really want a good, accurate, typical 48 hours of data. And because he slept most of the day yesterday and this morning……..we will not have that late tomorrow. So, we will stay and do this test justice. Well, that about wraps up Day 2! Thanks for listening to my ramblings! We so appreciate all of the support! God Bless!!!!!!!!!! You are all in my thoughts & prayers. Oh thank you Karen! Your support is so very helpful to us during this time! Thank you so much for faithfully following our journey!